- Add option "play head follows cursor position"
- Fix a bug with corrupted access of memory in some conditions. (Thanks to Frank! Having used a previous version of this player/editor. I figured to get this update. But on windows 7 this version is crazy, frankly. When I start the application, I get a window called "test for open file selector", with supposedly the option to select a WAV file or other audio file. However, whatever file you select and try to open, the window won't go away! There's simply no way to get rid of it, as all the application's functions (such as access to a "preference" menu) are blocked. Maddening, really. Anyone else getting this? Also, there's no manual whatsoever, or even the slightest help file, anywhere online. I would suggest to the developers: if you don't want to make a manual, then keep things simple, and obvious: KISS rules! I did regularly use the previous version 2.0.16 (which doesn't give the crazy start-up problem), but only for quickly browsing / checking certain files, under certain conditions (otherwise, I use other software) even if I found some things kind of clumsy / awkward, or simply buggy. And yes, I did check all settings extensively, there should be no error on my side. But who knows, even if I DID do something I shouldn't have, using the default settings (and such) should have avoided such an error. For the time being, I've reverted to the previous version, and only use it for quickly browsing files. - Fix a Windows startup crash. - New seconds horizontal scale. - New link between markers/regions with main window. - Fix an error when opening multiple files. - New link between markers and audio properties dialog. - Fix Windows startup bug. 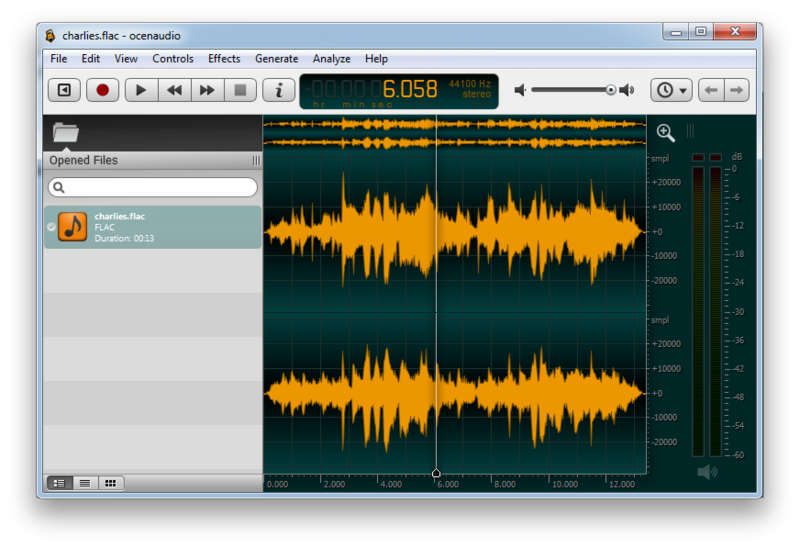 - New audio screenshot dialog. - Fix an issue when opening files. - New Hungarian translation (thanks Koncz László). - Add option for resolution selection when creating new audio files. - Fix problem that could cause a crash in some situations. - Fix GapLess no MP4. - Add pause capability on markers. - Changes on ASIO device selection. - New way for change selections moving the borders. - New option for choosing filepath on Export dialog. - New option for only selecting full-duplex devices. - New regions drag-and-drop (using CTRL key). - Fix crash while dragging a file to ocenaudio. - Fix crash while saving files. - Fix leak after closing audio. - Fix markers and regions in CAF files. - Fix critical bug that crash ocenaudio.